We all want to save energy and money on our heating bills. But you also want a system that has a low initial cost and will last a long time. Efficiency plays a big role as well – how much is it going to cost you to heat your home? In home heating systems, there is usually a trade-off between what it costs to install a heating system, and what it costs to operate it. At one end of the spectrum, electric baseboard heating is the cheapest system to install, but its high energy consumption makes it the most costly to operate. 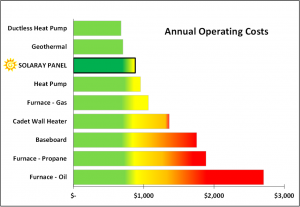 At the other extreme, a geothermal heat pump in the most economical to operate, but is extremely expensive to install, typically costing over $30,000 to install. What if I told you that there was a heating system that is nearly as inexpensive to install as inefficient cadet or baseboard heaters, is 35-50% more efficient than those heaters, is as simple to install as a light fixture, requires no maintenance, operates completely silently, comes with a Lifetime Warranty and has a 40 year expected lifetime? Sound too good to be true? Well is isn’t. Sola Ray panels combine the best of both worlds with a low installed cost and a high operating efficiency. GET A FREE INSTANT ENERGY ESTIMATE AND SEE HOW MUCH YOU CAN SAVE!! Of course, investing in a heating system isn’t something you do everyday. You expect this system to last a long time and you want to be sure that hidden costs, like heating inefficiency, maintenance, repairs, and replacement, to be low over the life of your home. What you are really interested in is what experts call “Total Cost of Ownership” or TCO, which adds up installation costs, heating costs, repairs, maintenance, and replacement costs. SolaRay panels have a low install cost, high efficiency, and the lowest Total Cost of Ownership. 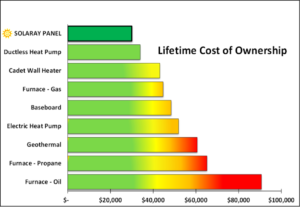 As you can see, Ducoterra’s SolaRay panels can SAVE YOU THOUSANDS OF DOLLARS over the life of your home. 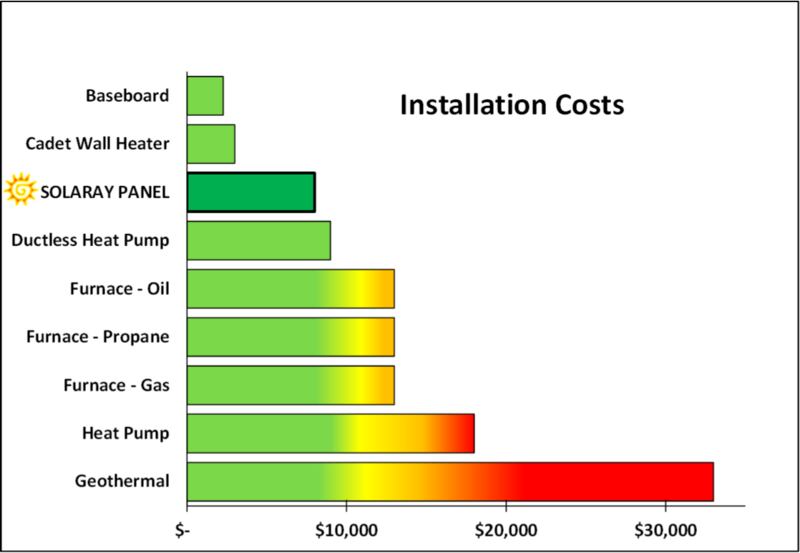 When amortized over the expected life of the system, SolaRay panels are half the cost of baseboards and 10% less costly than ductless heat pumps. 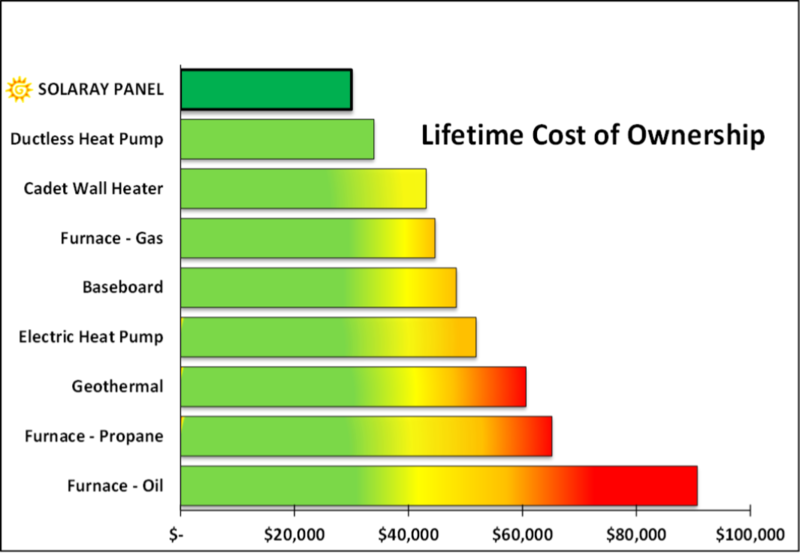 In fact, the US DOE recommends radiant ceiling panels as an energy efficient alternative to other heating systems and a DOE/NAHB (1) study found radiant heat ceiling panels resulted in cost savings of up to 52% over baseboard heaters and 33% over air-to-air heat pump systems. Ducoterra’s SolaRay panels offer the same benefits as in-floor radiant heating, but without the cost or complexity, typically costing only 1/3 as much as a radiant floor system and half the cost of a forced air system.